Each frame is .1 second apart. This sequence displays both a breathing and non-breathing stroke. Frame #1: This position is immediately prior to the hand-entry after a non-breathing stroke. The head is well down which produces a flat shoulders-to-knees posture (streamlined). The legs prepare to kick to counter-balance the large vertical force component of the arm movements at entry. Frame #2: The hands have entered shoulder-width apart but because of the lateral sweeping action of the arm recovery, inertia has caused the hands to continue inward to a narrower position. In this frame the hands have stopped their after-entry inward movement and prepare to move outward in a brief sculling action (note the pitch of the hands). The shoulders are elevated to produce a long reach forward. The head starts to rise. The legs have partially completed a kick. Frame #3: The hands scull outward for a brief time. This action serves to halt the vertical inertia produced by the arm recovery that is transmitted to the shoulders. In other words, this brief outward scull, an action similar to that of the initial stages of a breaststroke pull, stops the swimmer diving and disrupting the streamline. The head continues to rise. The legs complete the kick but are deep relative to the hip position. As a consequence of this probably unavoidable excessive kick, the hips rise. Frame #4: As in crawl stroke and backstroke, the upper arms medially rotate and the elbows bend, while the shoulders remain elevated (the "elbow-up" position). This sets the hand/forearm into a position where propulsive forces in a backward direction can be developed. The hands turn from an outward-sculling pitch toward a mainly drag-force-producing position. The head looks slightly forward while the remainder of the body and legs are in a flat and streamlined position. Frame #5: The upper arms are adducted so that the most powerful part of any stroke in swimming can be effected. Both hands and forearms are moved directly backward creating an extremely strong propulsive movement. The legs commence bending to prepare for a kick. The head begins to turn to the side as part of the swimmer's distinctive breathing action. Frame #6: The adduction of the upper arms has reached its effective limit. It is no longer possible to continue providing propulsion with the hand/forearm surfaces. From here the upper arms will almost stop any backward movement and extension of the arms at the elbows commences. The legs commence to kick. Frame #7: Arm extension in the propulsive pattern is clearly shown. The hands push back for part of the extension. The latter stage is ineffective for propulsion as the arms "round-out," with the elbows still bent, to extract the arms from the water while conserving momentum. As well as rounding-out, the hands are also forced to move laterally so that the hips will be cleared in the extraction. That lateral feature will reduce propulsive capability due to "lateral slip." In this frame, the arms are primarily moving upward (the elbows are quite close to the surface) and so the legs kick down to counter-balance the upward arm actions and their vertical components of force. The head is almost completely turned sideways. Frame #8: The kick is completed to time with the full extraction of the arms from the water. Inhalation has occurred between this and the previous frame. The flat streamline of the swimmer's posture from the torso to the toes is noteworthy. Frame #9: The recovery occurs while the head is returned to face down. The streamline is mostly maintained although the hips drop as a consequence of vertical forces created by the maximum height attained in the recovery by the arms. Frame #10: The face is returned quickly to look to the bottom. What is striking about this breathing action is that it is accomplished without much vertical movement in the shoulders. The hips drop slightly as the feet rise and the knees bend in preparation to kick. Frame #11: Preparation for the entry occurs similar to that which occurred in frame #1. Frame #12: The hand entry after this breathing stroke is slightly wider than the entry in frame #2 which was after a non-breathing stroke. Frames #13-#17: The stroking action is similar to the previous sequence. However, on this non-breathing stroke the head is kept completely covered and the shoulders remain low in the water. The consistent streamline of the head through to the knees minimizes frontal and wave resistance. There is no "modified wave" or rising movement in this aspect of the total stroking sequence. 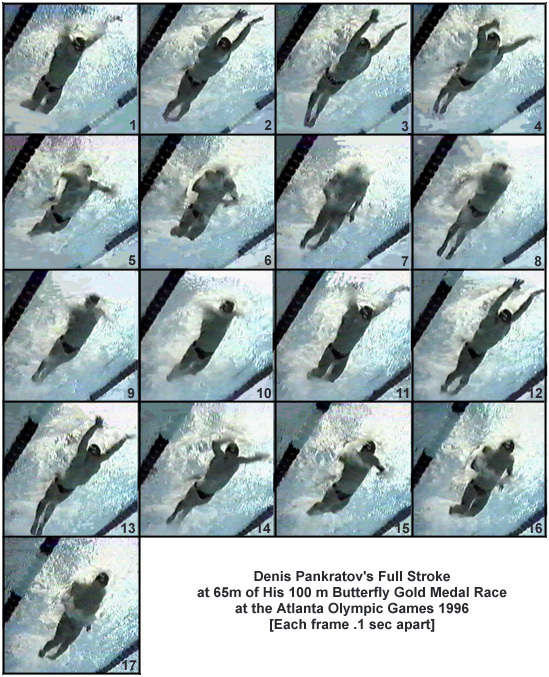 Denis Pankratov's stroke is one that emphasizes streamlining in the non-propulsive section of the swimmer's anatomy. The torso, and to a lesser extent the thighs, are primarily flat and underwater for almost the entire stroke. The side-breathing action requires a minimum of elevation of the shoulders, which should enhance movement. There appears to be nothing remarkable about the underwater propulsive action in this stroke. The hand/forearm propulsive surface is maximized in a manner similar to that exhibited by some of the champion crawl and backstrokers. The length of the propulsive phase of the stroke is maximized by the early elevation of the shoulders, medial rotation of the upper arms, and bending of the elbows to position the propulsive surfaces of the arms.